I have a love/hate relationship with meditating. When I do it regularly I see tangible benefits (love), but it’s hard to force myself to make the time to do it because it can be an extremely frustrating activity (hate). For a long time I resisted meditating because what I was originally taught about meditation was that the intention was to get your mental chatter down to zero. Which is pretty near impossible to do unless you’re a monk who meditates all day every day. And that is not the point at all. Being a perfectionist with a lot of mental chatter I got frustrated with meditation really quickly and didn’t give it much of a chance until I started doing a little more learning about it recently. I found that the purpose is to separate yourself from the mental chatter, and slowly make the gap between thoughts bigger and bigger. Be the silent witness behind the mental chatter. Watch it go by like the traffic on a busy street. No judgement. Just observe your thoughts with loving patience and curiosity. I found that I’m much calmer when I’m meditating regularly. I’m able to be a better parent too, because I don’t react as quickly with the kids. I’m able to take advantage of that mental gap of calm and give more thought to what the best way to address any given situation before I act. Circumstances don’t bother me as much as they used to either. I used to get really mentally twirled up in a lot of life’s situations and I don’t do that as often. Which is pretty liberating. 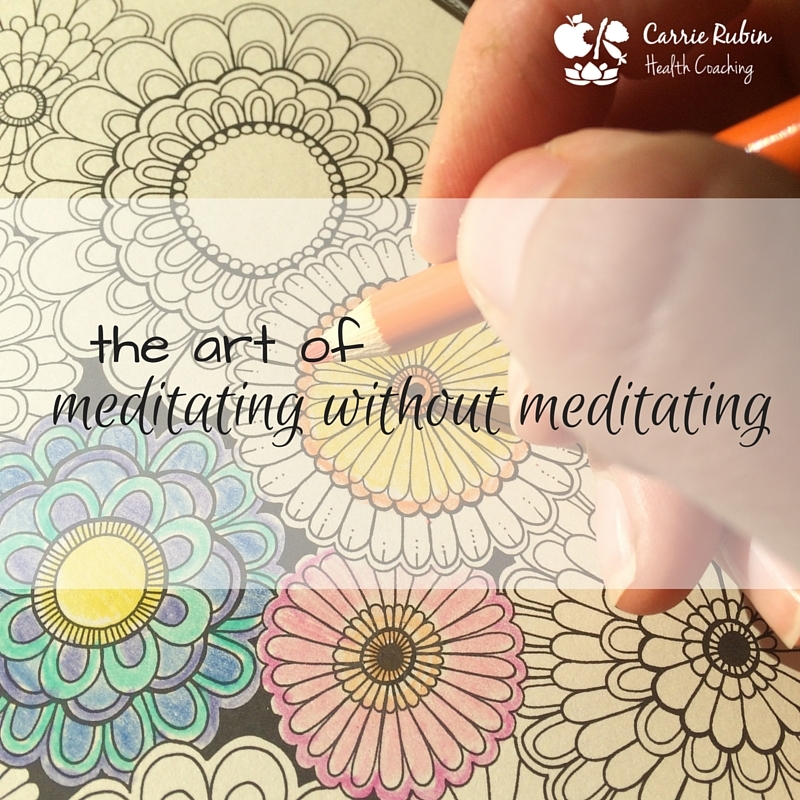 But, this post is not about meditating in the traditional sense… it’s about the more unique ways I go about clearing my head and bringing my stress levels down – how I meditate without meditating. Did you know that adult coloring books are all the rage right now? I stumbled across it when I was shopping for a birthday present for my BFF and picked up one for myself too. I’ve enjoyed coloring with the kids in their Sesame Street/Little Mermaid/[insert cartoon character here] books, but I thought that Secret Garden was a brilliant adult twist on a childhood favorite. It is so fun zoning out, choosing colors, and carefully filling in the tiny spaces with my colored pencils. 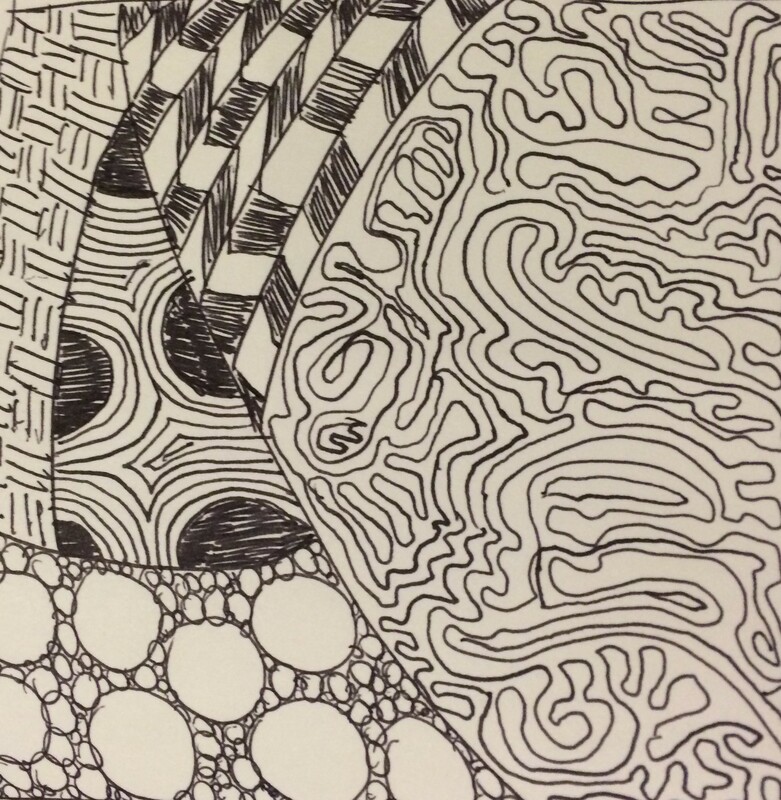 Another creative meditative art form I recently learned about is Zentangles. This practice essentially formalizes the doodles that line your work notepad (no, really, I was paying attention! ), providing a standard set of shapes/line forms and ideas for how to pull it together into a cohesive work of art. It’s really quite cool, and once you learn the basics it’s easy to get sucked into creating some elaborate and beautiful pieces while you clear your head. I was mentioning the above to my mother in law, and she chimed in with knitting as another great meditative activity for non-meditators. It’s been a while since I’ve picked up my knitting needles, but I recall it being very relaxing as well. 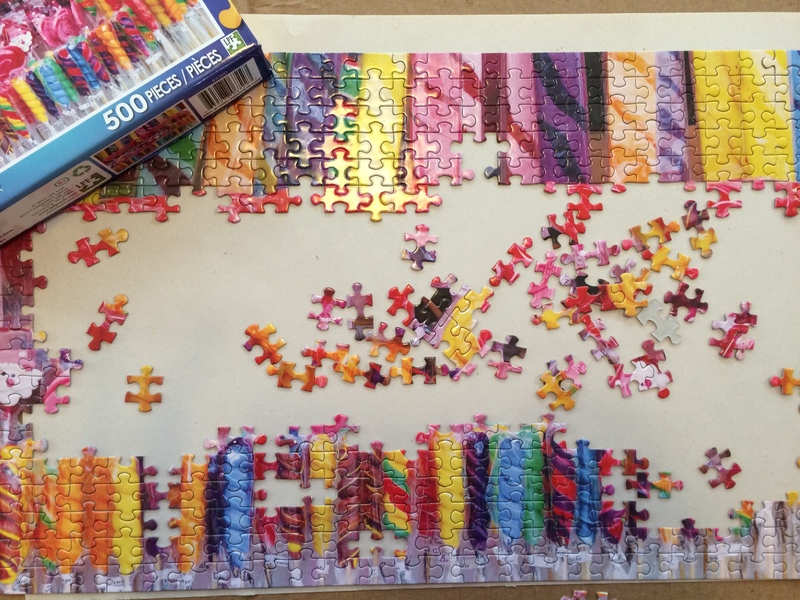 Another relaxing/mindful activity that I recently rediscovered thanks to the kiddos (especially Sophia, as she is a huge fan and really good at them) is PUZZLES! I picked up a 500 piece one at the dollar store (LOVE that place!) over the weekend and spent a couple of hours on it. I really enjoyed it and noted how the mind chatter went down significantly while I was focusing on finding just the right piece! What’s your favorite way to clear your head?